As advocates for deep change know, big success is often preceded by small incremental changes that may go unnoticed by the general public. It seems the effort to stop fast food companies from hawking toys to kids is gaining ground. Turns out five cents of every Happy Meal purchase goes to Ronald McDonald House Charities. According to the fast food giant, there’s a moral imperative to feed your children junk food. Over the past year, advocates have brought increasing pressure on McDonald’s to stop marketing to children. Corporate Accountability International’s Retire Ronald campaign is gaining traction. The Center for Science in the Public Interest is suing McDonald’s for using toys to sell Happy Meals to children. And San Francisco now requires that restaurant food sold with toys meet basic nutritional standards. To distract adults from the toy giveaways, McDonald’s is now working hard to convince parents that children can, and should, do good by eating bad. Meanwhile the company is running the same old Happy Meal ads during kids’ shows. No hope there, just toys, toys, and more toys. These days there is something you can’t see inside a McDonald’s Happy Meal. It’s called fear. I cringe at those commercials too, when they come up as I'm watching with my son. I usually say to the screen...if you want to give kids hope, wouldn't it just be better to help the kids directly? We don't go IN McDonalds (never have, with him, as I didn't want him to get marketed to and have to deal with the whole begging-for-McDonalds dynamic). Unfortunately he does watch Nickelodeon and now he DOES see quite a few McD's commercials. We talk about it. Like the cute one with the beautiful music and little animated birdies. Gorgeous. We talk about how that commercial is really pretty but it has nothing to do with the product, which isn't! My daughter (7 years old) has asked why I don't like eating at McDonald's. We do it, but I die a little inside with each Happy Meal. She asked "what about the Ronald McDonald House? If we don't eat at McD's, they won't exist." Yes, but there is so much more BAD that McDonald's does, from obesity, to heart disease, to diabetes, to environmental destruction, that it FAR outweighs the good of the Ronald McDonald houses. I was heartbroken when my friend's father was looking after my daughter and his grandson, and decided to take them to McDonalds. We had never been, for a reason. My daughter was, of course, thrilled with the fact she went and with the (garbage) toy she got. I guess, it at least it gave me the opportunity to explain to her why we don't go there . . . I don't see the commercials (we have a PVR and usually just watch nature shows at my house - though I can't say the same for my mom's . . .) and I hadn't heard about the donation thing, but I agree that there are far better ways of helping than eating poorly to do so. The negative effects of McD's across the board far outweigh their donations. We, as parents decide what or what not to feed our children. I do not blame McDonald's for marketing to children - they have done it all along - I blame the parents that say that it's okay to eat junk day in and day out. I am not saying that my children have never had a Happy Meal, that would be a lie - but what I am saying is that we do not choose to eat our every meal at McDonald's (or any other fast food place for that matter) People just want someone else to blame for their children being overweight when in reality all they need to do is look in a mirror to see whose fault it really is. Parents need to learn how to teach their kids that just like playing with fire there is a right and wrong way to treat food. Junk is bad for your vessel. If you choose to consume it then you will suffer the consequences. Marketing is trickery and if your dumb enough to buy into it then you deserve what you get. Parents should be showing their children this from an early age so they have the tools to make good food decisions. So tired of people treating kids like they can't think for themselves. They can and it is all about how you treat them before they are five that will shape these sorts of skills for later in life. The REAL problem is that the McDonald toys are LAME! I wish they would be a little more like Chick-Fil-A and give out little books or decent toys. 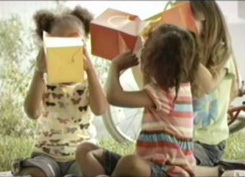 I hate the saying, "hope is a gift, this is the box it comes in" and shows a happy meal box. It seems like such a shallow interpretation of something so meaningful. If you don't feed your kids McD's - great for you, and them. However, you are still paying for the health effects of those parents that do not have your sense and fortitude. Health insurance premiums gone up lately? How about taxes? Well, most of the medicaid population feeds their kids McDonalds. As a matter of fact, most parents feed their kids McDonalds. So what? Too bad for those kids? They should have enough sense to be born to more intelligent discriminating parents like you? We are a "pro-life" society as long as the kids aren't born yet, as soon as they are out of the womb they are not our problem - their parents are the ones who are responsible. Of course that's true, but can't we help them out a little bit? Let's come in on their side rather than the mulit-billion dollar corporation who really doesn't need our help. Nice and a wonderful post. Keep it up.